THE ROAD TO KHALISTAN: "WHY KHALISTAN? WHAT'S WRONG WITH INDIA?" "WHY KHALISTAN? WHAT'S WRONG WITH INDIA?" Probably the question I get asked most often is: Why do you want Khalistan? What's wrong with India? The answer to the first question can be short and sweet, or it can be long and complicated, but it always must involve the second. You could, of course, simply look at the blog header pictures. " But that was 25 years ago! Get over it!" So I have decided to answer the second. I will be publishing articles, current articles, here that answer that question. I'm not sure exactly what I will come up with, but I rather imagine they will cover topics such as poverty, pollution, corruption, caste and the like. I can imagine that groups of people, such as Dalits, Muslims, Christians, even Naxalites will also turn up. I really don't know. We will find out together. I might anger some people. Correction, I will anger some people. I promise, though, that I will tell the truth as reported by the Indian press; I will not exaggerate. Where will this all end? I don't know. Really, I have no idea. This I do know, we Sikhs built India before there was a country called "India." We were the ones who fought and died and were imprisoned, tortured and executed by the British in the freedom struggle so that Mohandas K. Gandhi and his followers could claim a "nonviolent independence." We have worked hard. After Partition, our hearts broken by the broken promises of Nehru and Gandhi, we picked up the pieces and marched forward to benefit the nation that had betrayed us. Our farmers in Punjab have fed the nation. Our soldiers have defended the nation. Our businesspeople have largely sustained the economy of the nation. For these contributions, we are being treated to Sardar jokes, being portrayed in Bollywood as thugs and buffoons, being condemned as terrorists and, in general, being disrespected. QUALIFIED TO DO EVERYTHING WITH NOTHING. Some of us are sick and tired of all this. That said, this article came to me through IHRO a couple days ago. It is about a tribal woman in Assam who has shown great courage and class in not letting herself be humiliated into silence. Let it be the first in this series. A tribal woman who was stripped and assaulted in India's north-eastern state of Assam is to contest the parliamentary elections. Laxmi Oraon has been nominated by the regional Assam United Democratic Front (AUDF). 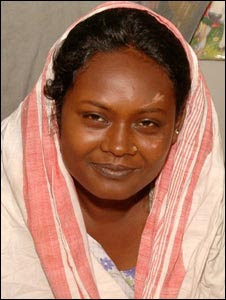 She was stripped by locals when she took part in a rally in 2007 demanding better tribal rights. Ms Oraon had joined the rally in November 2007 along with thousands of Adivasi tribespeople, who mostly work as labourers in Assam's 800 tea gardens. The rally turned violent and the Adivasis started vandalising shops and beating up policemen and locals before they were overwhelmed by a huge number of local people. Ms Oraon was stripped and beaten before an Assamese man took off his T-shirt, covered her and dragged her to safety. Nearly 16 months later, Ms Oraon has been offered a ticket to contest the Tezpur parliamentary constituency. "She is a symbol of Adivasi exploitation, of minority exploitation in Assam. We want her to contest the parliament polls on our ticket and she has agreed," AUDF general secretary Hafiz Rashid Choudhury said. Ms Oraon said while accepting the nomination: "I may not win but I want to make a point. That the Adivasis will no longer take the exploitation lying down." The AUDF is a Muslim-dominated party but claims to represent other minorities in Assam - among them the Adivasis, whose ancestors were brought from central India to work in Assam's tea estates by the former British rulers. Assam's ruling Congress party claims to represent minorities fairly, but the AUDF has increasingly sliced into the Congress area of influence among the minorities, especially the state's 30% Muslim population. "Our party has been set up to represent the interest of all minorities, so we cannot ignore the exploitation of the Adivasis," Mr Choudhury says. "And Laxmi is a living symbol of this exploitation." After her humiliation, Ms Oraon has often appeared in the media - particularly in the state of Jharkhand, where her ancestors came from. She was an honoured guest at the launch of a book by the leader of the Jharkhand Disom party, Salkhan Murmu, in Jharkhand's capital Ranchi last April. Ms Oraon also finished her school leaving examinations last year. "My humiliation did not end with the stripping and beating. It followed me to the examination centre, where I was taunted and teased," she told journalists. 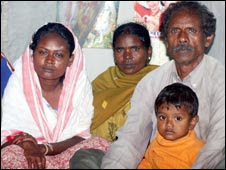 Ms Oraon and her family have accused the ruling party of trying to "bribe" her to stay quiet after the stripping episode. Congress firmly denied the charge. It says it handled the issue fairly, setting up a judicial inquiry commission to identify the culprits and punish them. Imagine, you are a young and dynamic person. You have the capability to prove yourself. If you want to do a job, it not so promising because it sets a limit. If you want to do business ,it requires capital. What’s the way out. Premier Financial Alliance (PFA) online is USA based Financial Alliance Company which can turn your dream into reality. Just you can join with almost no money and you ca see your dream come true here. If you would want Khalistan west Benagal want to be part of Bengal and North East want to have a seperate Western Country then Arunachal Pradesh wants to mingle with China. There are 2 rival for Jamu & Kashmir China and Pakistan.... In south they want a different space all again. So what exactly you seeking is dividing India into bits. The so called leaders all they want to be a ruler. Moving from democratic nation you want to be ruled by Dictators. I dont support leader who seek votes on the name of religion or on the name of caste or creed all I want people to see from their eyes and listen from their own ears. To me, the truth of most of what you say is obvious. India is going to fall apart. When that happens, East Punjab - including the parts ripped away into other states will become Khalistan. So believe all these smaller states will be ruled by dictators. You love India so much, yet you have no confidence that the various parts can properly govern themselves. I wonder if these "leaders" could possibly be any more corrupt than the current crop in Delhi. Time will tell. Perhaps in about 20 years, we will meet again and have some occurrences to back up our opinions. This is to convey a small message and to ask as well from you about certain things. Sir I totally agree that proud sons of India like Bhagat singh ji or Guru gobind sahib did a lot for the country sacrificed their lives, shredded their lives...I totally agree and understand. May be the promises made by jinnah, nehru and gandhiji were not fulfilled but they were political players first and then the citizens of this country. If they were then they could have save rajguru and subhash chandra bose ji. But are their community fighting for different nation. CAN YOU LIVE APART FROM YOUR OWN MOTHERLAND FOR WHOM OUR FOREFATHERS HAVE SACRIFICED SO MUCH. after all hindus and sikhs belong to same parents. And children may be of different nature. And its not that, that Hindus,Muslims,Isaiis have not sacrificed for the nation. We all have shed blood in the and for the soil of this nation. A bihari also works hard, bengali also, upide also and a kashmiri also. Two preliminaries. First, I am a woman, not a "sir." Second, thank you for signing your name. I get tired of cowards who express their Bharata Mata sentiments, but don't have the guts to sign who they really are. I consider my ancestral homeland to be the Empire of Maharaja Ranjit Singh ji, greater Punjab, not present day India. Your India has nothing to do with me. Historically, the subcontinent has never been a single nation. It is a conglomeration of hundreds of cultures and languages tossed together by the British for their administrative convenience. Today it is held together by masking tape and the Hindu-brahmin tyranny. It cannot possibly last. Obviously we have very different views; time will tell which view will prevail. Bole so nihal! Sat shri akaal! Khalistan Zindabad! I'm a Sikh. Every day is a chardi kala day. You have a nice day ji. So you consider your country the short lived empire of Maharaja Ranjit Singh? Barelly 50 years and an empire that quickly fell apart shortly after his death. Not really much ground for a nation. This ruler of Punjab, who kept a harem also worshipped the Devi and gifted the famouse Koh i noor to Lord Jaganath in the temple of Puri on the otherside of the sub-continent. Now why would he do that if he had no connection with other parts of India. Historically large swathes of the sub-continant has been ruled under one uniting force and it was not "tossed together". Since the time of the ancient Persians and Greeks viewed India as a vast entity, a region of many peoples, but all the same a geographic entity with loose cultural and religous affiliation home to the major religous traditions of Hinduism, Buddhism and Jainism. Sanskrit its literary root which deeply influenced all languages in the country and beyond. But you dream of a vast Punjab which of which there is no common form of language, religion or ethnicity, just another myriad, a reflection of India at large. Yet this Republic of India has already lasted longer than that of our long dead Ranjit Singh. Nothing lasts in the material world, if you are a Sikh of content you should understand that. If you are a Sikh of faith then you should also understand that Raj Khalsa Karaga is about ones state of being, not of relgious nation states. Sikhi was never about seperation and division of humanity. That is actually what you are asking for. With refrence to the above comment i would like to say "Nothing lasts in the material world, if you are a Sikh of content you should understand that. If you are a Sikh of faith then you should also understand that Raj Khalsa Karaga is about ones state of being, not of relgious nation states. Sikhi was never about seperation and division of humanity. That is actually what you are asking for." Dear M. Kaur we still belive in ones state.. but if u got deep abt the agreement tht had between ppl of punjab and congress party at the time whn thy asked punjab to be a part of india none of the terms promised by the govt. has been fullfiled. we never asked for seperat country thy forced us to ask for one. and now we need it. you can read my article WHY KHALISTAN tht i shared years back in tht time popular social network Orkut.